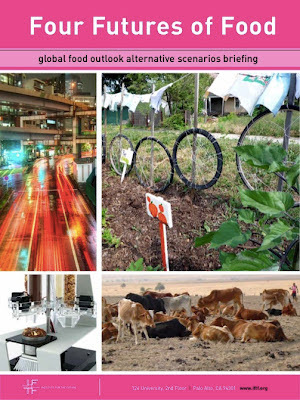 Our friends over at Institute for the Future in Palo Alto recently released a report to help people think about possible futures of food for the next decade. Four Futures of Food serves up a quartet of scenarios plotting out alternative descriptions of how America, as well as the wider world, could be eating in the year 02021. Each is based on a different trajectory that change could describe — Growth, Constraint, Collapse, or Transformation. In Constraint, a food poisoning outbreak triggers massive loss of confidence in internationally traded food and meat, as the global rallying cry becomes "Know your farmer. Eat local. Eat plants." Collapse is a future in which previously ignored stresses on pollinator bee populations cross a critical threshold to cause widespread crop failure and scarcity. In Transformation, people embrace lab-grown meats and domestic 3D-food printers which are networked to share recipes. Much as social media and blogging have upended the mediasphere, in this future, food supply chains and restaurants are suddenly reinvented. The narratives are recounted in just enough detail to help readers see how they could really happen, and further thought is invited by accompanying vignettes of a typical dinner in each world. The plausibility of the Four Futures is further underlined by examples, from the history of food, of each of the four classes of change. This set of alternative stories about the future describes a wide range of outcomes, yet each clearly grows out of specific seeds of change that can readily be found in the present, if we know how to look. Overall it is a really interesting, accessible, and usefully provocative piece of work from IFTF, shedding light on a critical subject; the viability and vulnerability of food systems. This appears to be a topic of great public interest and concern, as attested by the works of Eric Schlosser and Michael Pollan, as well as by recent popular documentaries including Food Inc, King Corn, and The Future of Food. The Long Now has also made a contribution to long-term public thought and discussion around these issues, notably through Jim Richardson’s recent SALT talk 'Heirlooms: Saving Humanity’s 10,000-year Legacy of Food' and Pollan himself on 'Deep Agriculture'. 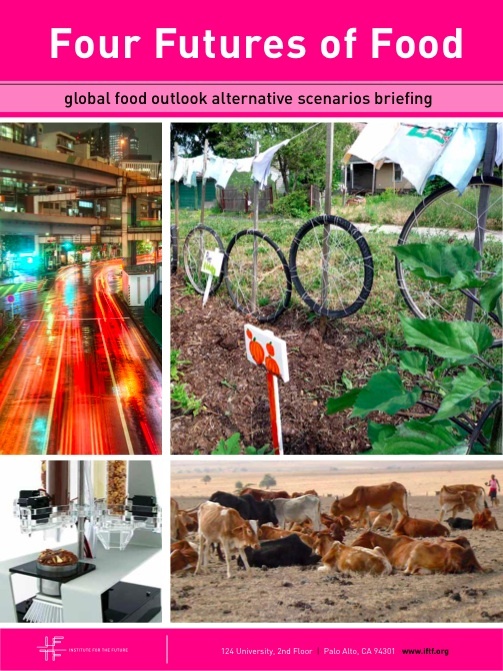 But I want to take a moment to comment on the story behind the stories that IFTF puts forward in its food futures briefing. Through working extensively with student and community groups in the then-embryonic field of futures since the ’60s, Dator’s key insight, which he published in the late 1970s, was that the countless disparate notions about the future could be grouped into these four categories. This made possible a different kind of conversation. From the chaos of incommensurate notions about possibilities emerges a way of characterising both the landscape of future narratives and individual elements in it. Similarly, devotees of the analysis of storytelling have long realised that although the specific narratives presented in various media are innumerable (plays, books, movies, TV, comics, etc), underpinning that huge set is a very small number of basic plots. The four futures can be used not only descriptively, but also generatively, Dator realised. Starting from the generic descriptor, such as Transformation, you can creatively 'deduce' specifics of a hypothetical future that tells a Transformation story. That’s not all you need, of course; to craft a premise for the story and details that are suitably thought-provoking, and then to express these compellingly, all are elements of a scenario-producing artform. But what the four futures offer is a valuable starting point for testing our thinking across the widest conceivable array of potential outcomes. Dator was among the first to develop curriculum around futures studies. Until the early ’70s, there was no such thing as a university program that taught thinking systematically about the ways the world could change. Since that time, a small yet lively and internationally distributed community of futures scholars and practitioners has emerged — although in many ways it has been disconnected from mainstream public discussion of 'the future'. There’s a profound irony here: a critical starting point for futures thinking is rejection of the artificially siloed way in which university disciplines produce and share knowledge, and yet until recently, the silo of academia itself prevented insights from the field from making their way into the wider culture. The net result is that even after almost half a century of futures studies, mainstream thinking about the future remains tragically shallow. Perhaps its principal shortcoming is an obsession with prediction (THE singular future), which the field of futures studies has recognised from the outset as a fatal limitation. Which brings us back to the excellent contribution of the Four Futures report. As the introduction notes, "When imagining the future, we often assume things will keep moving in the direction they have been in the recent past." It goes on to use Dator’s four generic futures to create four radically divergent stories about the future of food, as a basis for encouraging the reader’s further exploration. Many ways other than this are of course available for generating scenarios (such as the well-known 2×2 matrix developed by Jay Ogilvy and his colleagues at GBN), and many methods other than scenarios for thinking both rigorously and imaginatively about possible futures. The point is that wherever such methods are used engagingly, competently and transparently for a public audience, there is some possibility of collective learning. The usefulness of mainstreaming methods such as Dator’s archetypal futures is that it moves towards a futurist equivalent of teaching people to fish, rather than feeding them fish already caught -- scenarios mysteriously cooked up somehow behind the scenes. Thus, both this IFTF report, and its coverage in mainstream journalism (by the always excellent Ariel Schwartz over at Fast Company, for example) can be seen as small but significant signals, not only for the future of food, but for the future of futures. They are small steps in a gradual cultural process of open-sourcing deeper, longer, and wiser thought processes -- or so we may hope. Originally posted at The Long Now Foundation blog, 27 March 02012.